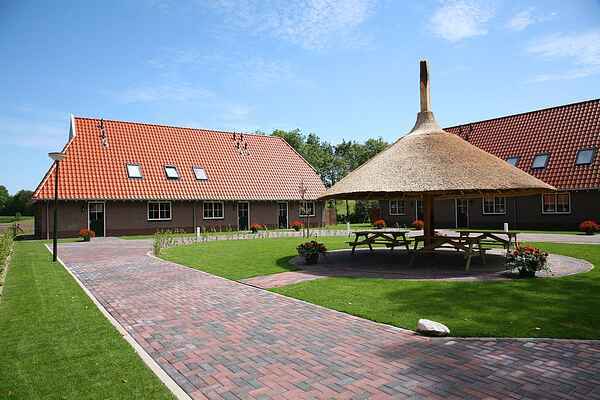 These farmhouse apartments are on a holiday park in the countryside near the town of Enter. The town is in the province of Overijssel. The apartments were built in 2010. They are comfortably furnished and equipped with all modern conveniences. Youll feel at home immediately. The holiday park promises good service and plenty of enjoyment. Children will really enjoy themselves here. There is a pets corner, mini golf and a playground. These require payment. The surrounding area has much to offer. The region of Twente offers tranquillity, beautiful scenery, culture and history. The cities of Almelo, Hengelo and Enschede are well worth a visit. You can explore the area's delightful landscape on a wide range of cycling routes and walking trails. Children will love the Hellendoorn Adventure Park and the Slagharen Pony Park. This is an ideal holiday destination.